Port Vale manager Neil Aspin had no complaints about his ten men losing 1-0 at Mansfield Town in the end today. But Aspin claimed the Valiants should have had a penalty when Tom Pope went down next to Hayden White early on and said it could have been a very different game if that had been give. “You have to analyse the game as a whole,” he said. “If you're talking about chances then Mansfield had a lot of opportunities in the second half when they could have scored so there is no way that on chances created we deserved anything from the game. “I thought we had a good shape in the first half and started the game well. And we should have had a penalty. I've looked at it against and Tom Pope gets his shirt pulled in the box. It's obvious to everyone and that changes the game. 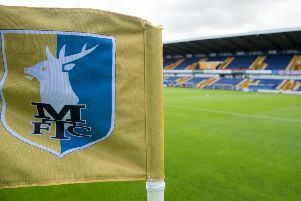 “When you go behind against Mansfield it does give you a problem as they have of players up front and, when you're pushing, it leaves space behind you. On Manny Oyeleke's 64th minute red card for a second bookable offence, he said: “I have no complaints. “From where I looked, when you're on a yellow card, it looked like another yellow card.